Details relating to the Slovenian Commemorative of 2016. 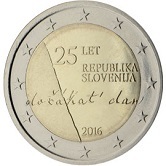 The coin has been issued on the occasion of the 25th anniversary of Slovenian independence. In the inner circle stands “25 LET REPUBLIKA SLOVENIJA” (25 years Slovenian Republic). Also seen is the phrase “dočakat ‘ dan” (wait for the day). This is the handwriting of author France Prešeren and is from the Slovenian National anthem (Hymne Zdravljica) which he wrote. The year of issue 2016 is seen between five and six o’clock. Return from Slovenian Commemorative 2016 to euro coin collector.